Select deposit method what you prefer. Click "Submit" tab and play in your casino. Depositing is instance for electronic payment methods. But let's review more detailed how to do casino deposit by credit card. For example we take Cryptologic casino software. When you login to your casino account you must choose `Cashier` button. At first time you must register a new credit card. 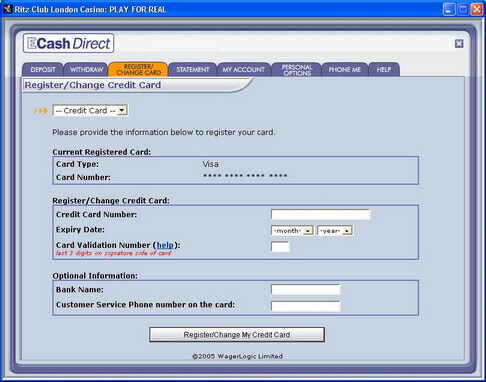 Fill the form with your credit card data and press `RegisterChange My Credit Card` button. If all is ok, you will see window like this. 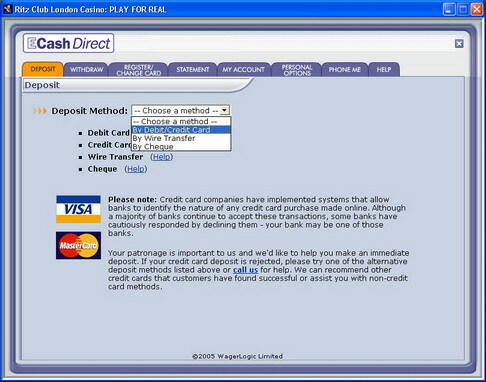 Now choose Credit Card option in Deposit tab. In next form enter the amount you wish to deposit and card validation number. Card validation number you can fount on signature side of your card. It is 3 last digits of your card number that typed in signature place. Then press "Submit" button. If casino have promotion program you will receive additional free money as bonus.